Did you hear us squealing with joy from where you are? We couldn’t help it — when we heard that the French fashion house is partnering with Pierre Hardy to launch a new equestrian themed collection it was just too exciting! We haven’t seen the pictures yet, but the line is purported to include a whip-shaped diamond necklace and the horse-hoof-inspired rose gold and black jade Centaure necklace. It’s going to be amazing, no doubt about it! Of course, being Hermes means it is also going to have an amazing price tag. 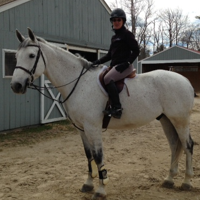 Without exaggeration, you could buy yourself a horse — perhaps an entire stable full of horses and the barn itself! — for what the new line is going to cost. No matter! We’ll get that lottery ticket someday! Meanwhile, there is a lot of vintage Hermes and Hermes inspired equestrian jewelry available right now. Long a favorite of many horse jewelry collectors, the elegant lines, strong styling and bold grace of these pieces make them appropriate in any setting. 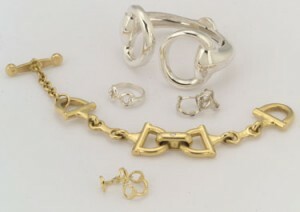 At the moment, we’re particularly entranced by this amazing 18K gold snaffle bit bracelet. Imagine this dangling from your wrist: substantial enough to make an impression, airy and designed not to be heavy on the wrist. Every movement, every wave, every handshake, creates just enough sparkle and shine to make meeting you memorable. Hermes did so much with the bit motif — you can see that here in this lovely vintage bracelet and it is truly a fabulous way to communicate your love of horses.